The classic Daniel Patrick Moynihan quote that “everyone is entitled to his own opinion, but not his own facts,” is an import maxim in public policy debates. This is doubly so in criminology, where billions of dollars, quality of life in communities, and — most importantly — the very safety of law-abiding citizens rest on policymakers getting it right. But despite the facts, critics still maintain that Texas’ criminal-justice reforms have failed to reduce crime and recidivism. The reforms at issue began with a spate of legislation passed during the 80th Texas Legislature in 2007, including a sweeping reorganization of the state’s community correction system under HB 1678. Facing prison and jail capacity overruns with no space to house violent offenders, the legislature prioritized probation and parole for low-risk offenders. We’ve illustrated time and again that once these policies were in place, crime rates continued to fall in-tandem with these reforms, despite similar protests from critics of the day that the opposite would happen. 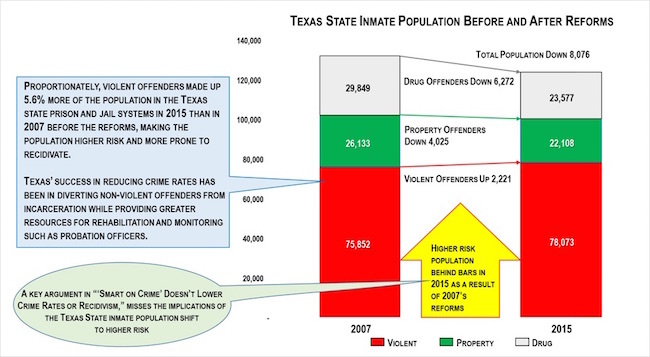 Texas’ 2007 criminal-justice reforms shifted many non-violent offenders away from incarceration while increasing resources for proven rehabilitation programs and supervision, such as probation officers, resulting in improved public safety. It’s almost a cliché that limited prison capacity should be reserved for “those who we’re afraid of, not for those we are mad at,” prioritizing bed space for violent or high-risk offenders. This was not the case in Texas prior to 2007, when only 22 percent of the admissions to state facilities for violent, property, and drug offenses were violent offenders. In 2015, this number grew to 27 percent, meaning that the prison composition on net became far more criminogenic. In fact, contrasting admissions from the two years, the only population that grew in raw terms was violent offenders. Was this because Texas was suddenly beset with bands of violent super-predators marauding the state after having been given lenient sentences? Clearly not. Texas’ 2007 reforms didn’t address violent crimes. But had we kept the status quo, we would have likely not have had the space to house new offenders. On pace, we would have been 11,464 over operational capacity by 2010. (“Operational” capacity, not design capacity, means milking every last square foot of residential space in a facility.) Texas’ state beds now hold a greater number of violent offenders than they did before the reforms. The bottom line is that Texas has successfully focused criminal-justice resources on violent offenders while diverting non-violent offenders — whenever appropriate — to alternatives to incarceration. The data show that the non-violent offenders who received probation or who were diverted to rehabilitation programs are now less likely to reoffend than before when they were housed with violent offenders in the general prison population. Texas’ criminal-justice reforms have made Texas safer. They are — and should remain — a model for the rest of the nation. Derek Cohen is the Deputy Director of Right on Crime. During his Ph.D. coursework, he taught several undergraduate sections of criminal justice research methods and statistics. Randy Petersen is a senior researcher with the Right on Crime initiative and a veteran of 21 years of law enforcement as a sworn officer.